After many years of our own trials and research, 'The non surgical face lift Dermalift' proved to be effective and successful. Technology has advanced greatly over the years, with the Dermalift still holding itself as one of the most popular treatments around, with excellent results amongst our clients. Clients have seen a 60%-75% improvement of tighter, firmer muscles with fine line reduction. 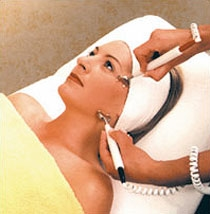 The machine also concentrates around the full eye area with an immediate firmer smoother, lifted feel!